Have you missed a day? Don't worry! 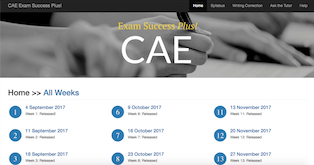 "CAE Exam Success Plus!" features a weekly revision test for the Word Bank, extra Spotlight Paper 1 exercises, model answers for the Writing Class and practice tests! Tell me more! Get access to our 'Word of the Day' revision exercises with "CAE Exam Success Plus!". Build an organised record of vocabulary with these worksheets. Self study mark sheets to help you keep track of new words. "Very, very good organised and structured and really useful and effective!The wohle website is very good. What I most prefer is the Word bank with its step by step learning Learning English with flo-joe is encouraging and delightful. It seems to study comfortably on your own sitting at your desk but always helped and guided by a teacher."